Despite its power in the living room, the remote control is a largely unloved device, its endless array of buttons more confounding than comforting. But what if your favorite phone or touch-screen MP3 player could take on the tasks of the remote control, replacing the riot of buttons with a truly intuitive interface? That's a promise that's slowly taking shape with the rise of innovative gadgets like the iPhone and iPod Touch, which can be programmed to do any number of jobs. Apple has made it possible for iPhone and iPod Touch users to control their iTunes program or Apple TV through a downloadable application called Remote. Sonos, the maker of multi-room music systems, released a free iPhone app that allows customers to use their iPhone instead of a Sonos remote. And last week, Apple approved an app from iTV that allows consumer electronics makers to easily build iPhone apps that can serve as remote controls. ITV said the first devices to get the support are TiVo digital video recorders. It's still just a trickle and no immediate threat to the venerable remote control or third-party universal remotes. But the emergence of remote control apps creates some intriguing possibilities. Instead of a static array of buttons, an app can be dynamic and more easy to use. And it can change over time with a simple software update. "You'll see the phone as a remote control more and more," said John McFarlane, CEO of Sonos. "It's better than any infrared device you've picked up. It's a wonderful platform, and you don't have to train someone to work with another device." This scenario works only on electronics gear that can connect to an outside gadget. 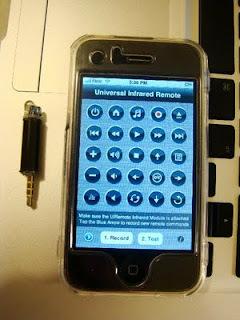 While remotes use infrared signals, most phones don't have that capability and would need some kind of accessory to control other devices. And this set-up depends on an iPhone, an Android-based handset or a similar device, which generally start at $199. But as more and more electronic devices get Internet access and wireless connectivity through Ethernet ports, Wi-Fi or Bluetooth, it opens the door for communication with the growing number of handsets. "I think the biggest advantage of a touch screen is you don't have to show all the buttons all the time," said Carl Howe, an analyst with the Yankee Group. "You can have literally just two or three buttons that are most commonly used." But the benefits aren't just about simplifying the user experience. Apps can change the way people interact with their consumer electronics. Take, for example, the TiVo app being developed by iTV for Series 3 TiVos. ITV makes a program for the iPhone that allows people to see what shows are on and allows users to sort through programs by genre and actors. But future versions could allow people to use an iPhone not only to consult a program guide or change channels, but also to get previews of other channels or videos or pull up relevant data. Or perhaps they could participate in real-time surveys, contests and fan forums. It would make the gadget a complementary second screen, not just a control device, said Brad Pelo, CEO of iTV. "What's intriguing is the second screen can now become truly interactive," he said. "As you're watching media, you can interact with it and with others watching at the same time." It could also be a boon to advertisers, giving them a way to reach people through offers that are tailored to their viewing habits. Again, the future is still being written. But electronics-makers and cable companies are intrigued by the idea. Vizio, for example, has installed Wi-Fi and Bluetooth in new TV models and is open to the idea of creating a remote control app or having an outside developer pursue it. Logitech, which makes the popular Harmony universal remotes, is also taking a look at the technology. Scott Harrington, director of product marketing for Harmony remotes, said it wouldn't be too hard to build an infrared peripheral for an iPhone that could enable it to communicate with consumer electronics devices. But he said feedback from Harmony users indicate they still want physical buttons for some of the simplest tasks like volume control. "The best experience is having a minimal set of buttons because people like to use the product without having to look down at a touch screen for every function," he said. Still, the time may be ripe to overhaul or replace the remote control, said Mike McGuire, an analyst with Gartner Research. "I don't know anyone who loves the remote control," he said. "It's either line of sight issues, or for me I have to change the batteries. Or you grab the wrong one. If people are consuming more media, to have an application that eases their burdens makes a lot of sense." No Comment to " Turning iPhone into remote control "